The truth is that a flashlight could mean the difference between you making the shot and missing it completely. 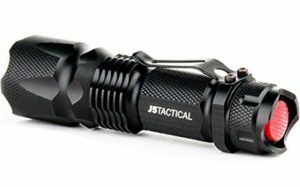 Regardless of whether you are going on a casual hunting trip or you need it for professional purposes, a flashlight is something that should always be with you. And while years ago flashlights were larger in size and rather burdensome to carry with, they’ve since evolved quite a lot. What is more, their overall capabilities have increased tenfold, including but not limited to weight, compactness, brightness, battery life and overall features. However, picking the best one is definitely rather challenging. This is the main reason for which we’ve handpicked 9 of the best options on the market in an attempt to save you all the efforts. So, without any further ado, let’s go ahead and give it a go. 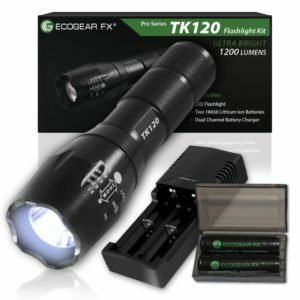 What you can be absolutely sure about is that the EcoGear FX is no joke. And while this flashlight is quite economical, it surely doesn’t lack in any other aspect. The unit comes with two completely rechargeable batteries, as well as a particularly quick and rapid charging station. A quick charge is undoubtedly one of the things that you want to consider, but this specific flashlight offers even more features. Furthermore, the LED lighting is also of high-quality CREE T6 and it is conveniently stored within an anti-shock as well as an anti-abrasion tough casing on the outside, made of aluminum which is, of course, military grade. This particular flashlight is also a bit longer – about ¾ of an inch longer than the majority of the items on the market. This adds quite a lot of convenience in terms of gripping capabilities. The shaft is also a bit longer, hence allowing for a proper striking surface area. 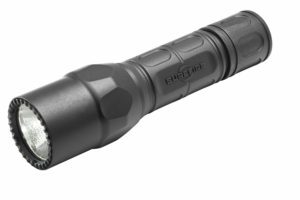 If you are looking for a particularly bright tactical flashlight, the Streamlight 88061 is the obvious choice. It’s small enough to fit in your pocket yet large enough to help you in any kind of emergency and self-defense situations. This is always something that you want to be looking out for when it comes to it. Now, it’s also worth noting that it combines convenient C4 LED Technology which gives the user perfectly lit beam of light for a pocket flashlight. Furthermore, it’s crafted from aluminum with machined aircraft quality, guaranteeing that this is a particularly extruded unit. It’s easy to handle and it is designed with high-performance and durability in mind. 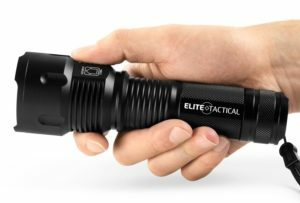 When it comes to tactical flashlights, SureFire is a brand which is well-established, reputed and trusted. They’ve been on the market for quite some time and they always seem to be able to produce units of the highest quality. 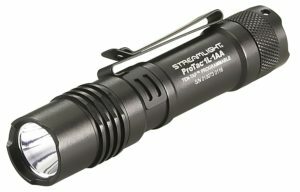 This particular one comes with 320 lumens on the highest setting and it comes in 6 different colors. The body is extruded with anodized aluminum bezel. In case you are wondering – this is flawless for self-defense. Furthermore, it’s designed with the needs of different professionals such as law-enforcement officers in mind. It is durable yet lightweight, making it the perfectly portable option that you’d want to use. At the same time, the features that it boasts are convenient and prominent. The V1-Pro Flashlight is a product which is well-known for being an original 300 lumens tactical flashlight. It is named after the official one which was brought by Carl Edwards and Joe Gibbs. Now, this is undoubtedly amongst the best-selling products currently on the market. It features a LED light and it is run on a single AA batter. You can alternatively use a 14500 rechargeable one. The product is designated to be long lasting and particularly convenient. The beam of light could easily reach out to about 600 feet, provided that the night is clearer. This is about 2 football fields in length, to put it in comprehensive prospective. It also comes with three brightness settings – strobe, low and high. The first one is designed for cycling. 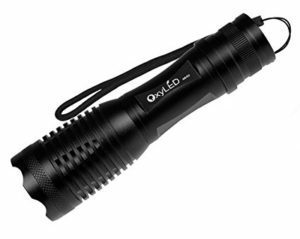 The first thing that’s worth noting and represents significant interest for most people is the fact that the OxyLED Super Bright flashlight could be purchased in an inexpensive bundle. It comes with an AC charger, charger bas, a tube for fixing your battery and a couple of rechargeable batteries. This is something particularly convenient. 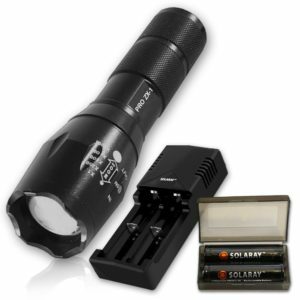 The flashlight is built out of very durable aluminum alloy which is of aircraft grade quality. It’s also worth noting that it’s covered with an anti-reflective coat in order to ensure maximum brightness – regarding the lenses. It can also be used when it’s raining outside as it has very high water resistance levels. There is also a convenient built-in protection in case you want to immerse it in water. This shouldn’t cause any issues. You can choose 18650 rechargeable Li-ons or you can go for three AAA batteries – depending on your preferences. In all cases, this is a product worth taking into account. This LED flashlight is definitely of the highest quality. Actually, what’s on the table is a kit which includes researchable lithium-ion battery, case for the batter and a charger. With this in mind, it’s also worth noting that this is one of the most powerful options on the market. The 1200 lumens LED lamp is going to last for more than 100,000 hours. It has a wide light range of about 500 meters. The product comes with five different specifications, including full, medium, low brightness and also SOS and strobe settings. There are quite a lot of things that you need to consider but it’s important to note that the product is designated to be a budget-friendly choice which is also quite cost-efficient when it comes to it. This is something important. 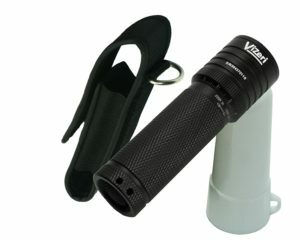 When it comes to tactical flashlights, Vizeri is a well-known manufacturer with quite a lot of experience in the field. This one is a true military product which comes with pressure-fit type torches as well as gold-plated springs to ensure that you don’t have issues with corrosion. The product is also going to do well in up to 3 feet of water and it’s coming with IPX7 waterproof grade. It could easily be fitted with AAA or with CR123 alkaline batteries. The light is particularly bright and also very intense, regardless of the lumens. This is mainly due to the fact that it uses CREE T6 XML LED technology, which is particularly powerful and to be considered. Of course, it comes with the regular five settings just as the ones listed before. There are a few different models of this series, but we are currently taking a look at the Elite Tactical Pro 300 Series. It’s constructed from material with military grade of stability and it’s been tested to be shockproof, waterproof and it can sustain floods or heavy rains. Speaking of durability, the manufacturers have run over it with 4-tons plane and all was good, so this isn’t something that should concern you at all. The product, despite its tremendous durability, is actually rather light in terms of weight. It’s very intense but at the same time it fits in your pocket. You can zoom it in to focus the beam or zoom it out to disperse the light, depending on what you want. The charger is included but you might be better off with getting a brand new one. The ZX-1 Professional model of this series is one that deserves quite some attention. It’s made of aluminum of aircraft grade in order to ensure that the durability is of the highest possible standards. It’s fitted with high-quality lens, it’s water resistant and it’s particularly effective. The design, at the same time, is small and rather compact while durable and extruded in terms of sensations. This is something that should be accounted for. It’s also really comfortable for using. The battery, being one of the most important factors that you should consider, is reliable enough. You can rely on the SOLARAY 18650 3000 mAH lithium-ion battery which is also rechargeable. You can recharge it a total of 500 times, which means that you will be using the flashlight for quite some time before you have to consider replacing the battery. These are undoubtedly some of the best options on the market that you might want to consider. However, they are far from being the only ones. As you can see for yourself, there are a few very important components that we revolve our reviews around, so let’s have a look at them so you can make a choice even if it’s not on the list. There are quite a few things that are of importance, but let’s focus on the most integral ones which will truly make a difference, even for a casual use. Obviously, you need something which is compact and convenient and it’s going to ensure that it’s not an imposition in your pocket. When it comes to it, you need to look for something of relatively lightweight. However, this doesn’t meant that it would jeopardize the sturdiness as we’ve pointed out in some of the reviews above. The casing is the thing which protects the internal components of the flashlight. Therefore, you need to ensure that you are getting a unit with high-quality and durable material. Military grade aluminum as well as anodized aluminum are usually preferred because they are also quite light in weight. Obviously, the flashlight has to be powerful enough to fill its purpose. This, however, is something which is entirely dependent on you. Make sure to purchase something which is going to be able to cast the light to at least about 250 meters. There are quite a lot of different settings but you should ensure to get a unit with at least 5 of them – medium, high, low, strobe and SOS. All of them have different designation and it’s important to take them into account as they could potentially help you out quite a lot. Now, we are putting this as a last on the list of priorities but it’s something that you might want to consider. You are buying a tactical flashlight, afterwards, and if you are a law-enforcement officer, self-defense should obviously be a priority. 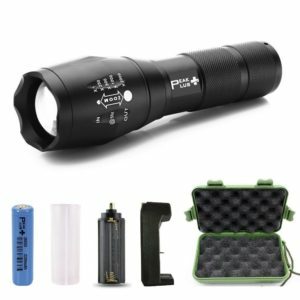 In any case, it is important to make sure that, regardless of the flashlight that you buy, it fits its purpose perfectly. Regardless of whether you need it for work, hunting trips or for casual use, it’s something that you should account for and this is going to determine the overall capabilities of the unit. It’s also important to stick to your budget. We’ve tried to incorporate options suitable for different budget types and that’s one thing that we take very seriously. We have high-end options on the list as well as particularly economic ones for you to consider.